Light Bulb Replacement - if the bulb has blown out, then we can often just install a bulb and gasket in the existing fixture. If the fixture is full of water or if the cord is compromised, then the fixture will need to be replaced. Light Fixture Replacement - if your light fixture needs to be replaced, our experienced repair technicians will remove the new fixture, pull a new fixture and secure it into the niche and test it out. 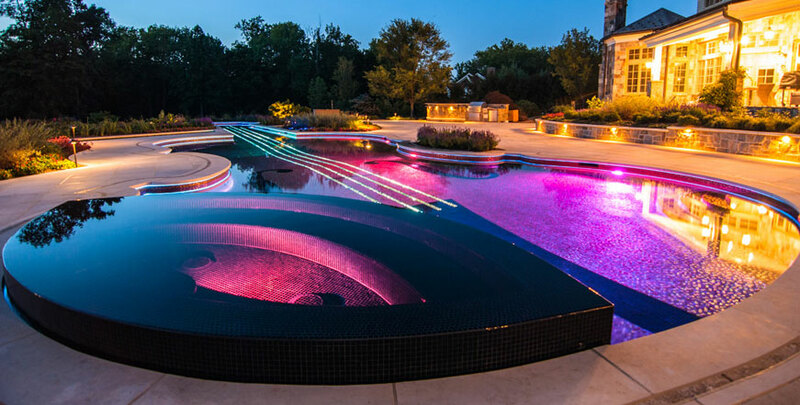 LED Bulbs and Fixtures - we offer LED light fixtures for most of the standard pool light niches. These use 85% less electricity and the bulbs last a lot longer. We also offer LED light bulbs that can be used in standard light fixtures. Fiber Optic to LED Conversion - if your fiber optic lighting is no longer operational or if it does not work well, you may want to talk to us about retrofitting your system with LED lighting. We have a lot of great retrofit alternatives from several different manufacturers to meet every application. Electrical Troubleshooting - if your light is not working sometimes the problem is not with the light fixture or bulb. The problem may be in the GFCI or the wiring between the controls and the light. Our technicians are trained to carefully troubleshoot these issues and recommend the best course of action for your situation.